Looking to create a digital resume site with WordPress? Digital resumes, also known as vCards to many people, are a great way to drag your resume into the modern age. 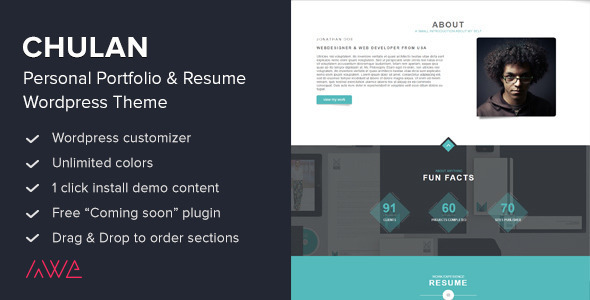 But if you want to showcase your CV online, you’re going to need a WordPress resume theme. And for that, I’m here to help! I’m going to list out some of my favorite WordPress resume themes from around the web. No matter what your style preference, I bet that you can find a great digital resume theme on this list! At $79, Sam Martin isn’t the cheapest resume theme on this list. But it backs up its price with a beautiful design, as well as add-on goodies like built-in Visual Composer for visual page building. With a huge full-width graphic, Sam Martin is definitely more focused on visual imagery than many of the other vCard themes. But if you have a good shot of yourself that you can use, it’s definitely attention-grabbing. As you’d expect with any resume theme, Sam Martin also includes dedicated sections for your biography, job experience, skills, portfolio, testimonials, and more. Certy is a gorgeous WordPress resume theme from PX-lab at ThemeForest. It’s still pretty new, so it’s not very popular yet in terms of raw downloads. But PX-lab does have another popular vCard theme (which will appear later on this list), so I feel comfortable slotting this one in. In pure design terms, Certy is my absolute favorite resume theme on this list. It’s just plain gorgeous – I encourage you to check out the demo and see for yourself. 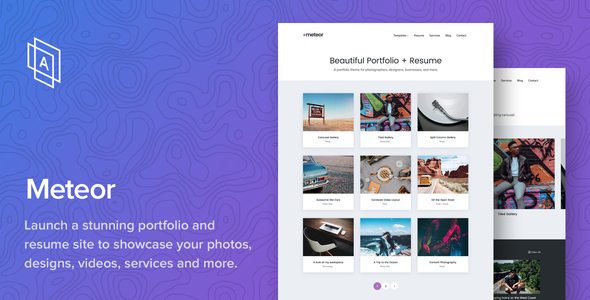 Beyond beautiful design, it also includes a built-in resume builder tool, visual timelines for your work experience, portfolios, testimonials, and more. 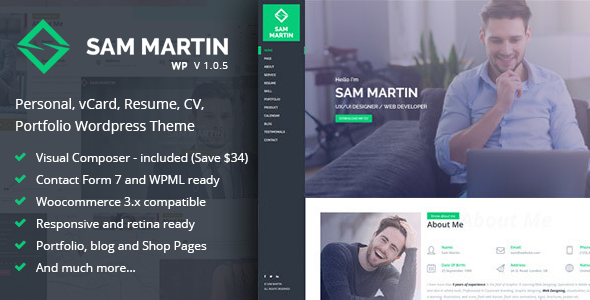 One WordPress is a Bootstrap-based flat resume and portfolio theme from sftheme at ThemeForest. It boasts a one-page design with a bold full-width slider at the top. Below the slider, visitors can peruse your biography, skills, experience, portfolio, and more. Your experience is illustrated by a neat timeline feature and you can graphically showcase your skills with circle counters. Gratify WordPress theme runs on WordPress 5. It's also made to be fully compatible with all the major functionality of Gutenberg content editor and the most recent GDPR demands. The theme is intended to become a quick starting point for the launch of online portfolio websites. The layout is optimized to handle content-rich web projects flawlessly. In addition to the drag-and-drop functionality of Elementor page builder, the theme includes a pack of premium plugins like Jet addon and Slider Revolution. If you want to establish a professional and reliable web presence for your business project, then Momex WordPress theme can be the ideal fit for this purpose. The layout looks clean and dynamic. It's spacious and quick-to-scan. The download package comes loaded with a series of ready-to-go pages and layouts that you can adjust according to your own needs. The theme is integrated with Elementor page builder. Due to its intuitive drag-and-drop functionality, you'll be able to modify the theme's pages without the need to tweak the source code. 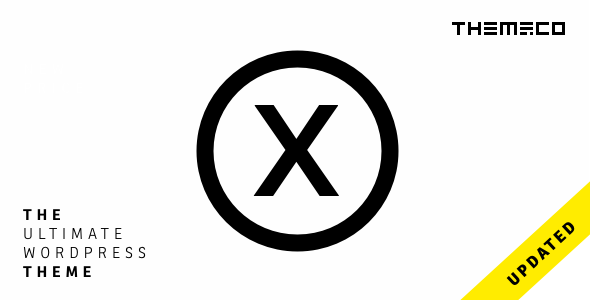 Like Divi, X is actually a multipurpose theme, rather than a dedicated resume theme. But as part of its multipurpose functionality, it includes plenty of pre-built demos that you can use for a resume site. Beyond that, it also ships with the Cornerstone page builder so that you can create your own custom designs using a simple drag and drop interface. Webion is a clean and clear WordPress theme that is perfectly suited to be applied for the development of any sort of consulting or design agency website. A minimalist black-and-white color scheme of the theme is specially chosen to keep users' attention focused on the content that you share on your web page. By the way, the theme is loaded with a series of extra page layouts that are ready to be modified by means of the drag-and-drop functionality of Elementor page builder. The theme is adjusted to look good on all screen sizes and resolutions, as well as a variety of web browsers. 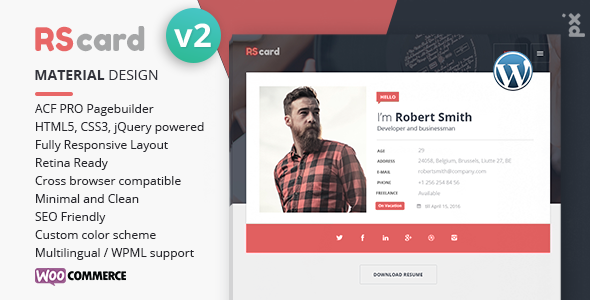 RScard is a WordPress resume and vCard theme with a modern, minimalist design. It comes from PX-lab, the same developer who made that Certy resume theme that I was gushing about. With that being said, people in other industries can also use the theme just fine. It also includes a portfolio feature, skill progress counters, and other resume-focused features. Promotion is another WordPress resume theme from PixFlow, the same developer as the previously listed Profession theme. Though it’s not quite as popular as Profession in terms of sales, I actually prefer Promotion’s design. It’s a bit more modern in my opinion. Like Profession, it ships with a few different demos for personal resumes, team CVs, and more. It also includes a number of animation effects and transitions, as well as a dedicated print button for your resume. Meteor is a portfolio and resume theme from Array Themes, one of the best WordPress theme shops out there in terms of clean code and performance. 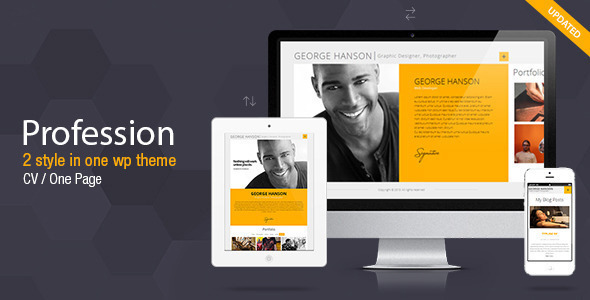 The theme includes dedicated sections for both your portfolio and resume. It doesn’t have as many vCard theme features as the other options on this list, but if you just want something clean and minimalist to house your work experience, it’s a great option. Profession is a one-page CV resume theme from PixFlow, another Power Elite Author at ThemeForest. It features both horizontal and vertical designs so that you can pick your favorite style. Personally, I’m a fan of the vertical style, which includes a bold slider, filterable portfolio, and graphical skill representations. Chulan is an interesting WordPress resume theme with a bold full-width design and parallax background. I’m personally not a fan of the parallax effect, but I’m a bit of a grouch when it comes to parallax designs, so you shouldn’t hold that against the theme. In its one-page design, Chulan includes separate sections for your biography, resume, portfolio, services, and more. Beyond that, Chulan also makes full use of the real-time WordPress Customizer for easy theme customizations. Because of its focus on showcasing a portfolio, Identity is a great vCard theme for designers, photographers, or other creatives. With that being said, it’s by no means exclusive to that niche because it also includes all of the other resume functionality that you’ve come to expect. That is, it includes spots for your resume, skills, and more. But it also includes neat sections like Process and Clients, which is again tailored towards creatives and freelancers. Ok, so Divi is technically a multipurpose theme. But it’s so dang flexible that you can easily use it to create your own vCard or resume site. With its counters and progress bars, the Divi Builder has all kinds of helpful elements to create a cool resume. The Divi Builder even includes a testimonial element so that you can easily bring in social proof to your portfolio site. 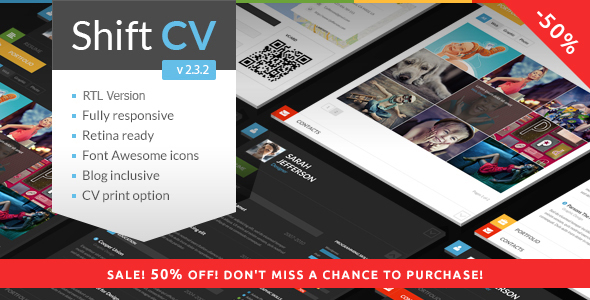 ShiftCV is a WordPress resume theme from ThemeREX, a Power Elite Author with a number of popular themes. It helps you easily create a vCard resume listing your skills and experiences. One of my favorite parts of this theme is that it also includes a built-in portfolio function to help you create a filterable portfolio gallery. And you can also bring in testimonials with a dedicated section for that as well. Beyond the vCard homepage, ShiftCV also includes a fully functioning blog that you can use to showcase your expertise. 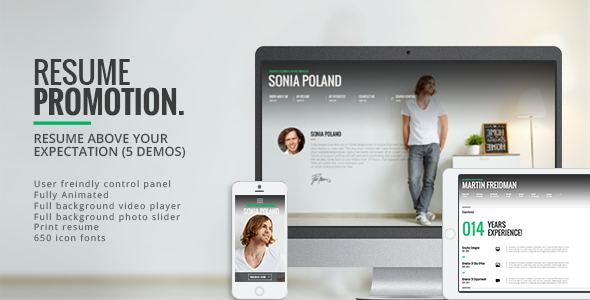 And that wraps up our list of the best WordPress vCard and resume themes! If you’re looking to create a digital resume or CV with WordPress, these themes are a great option for getting the job done. But as always, there are way too many WordPress themes for us to try to quantify every single one. So if we missed out on a great resume theme that deserves to be on the list, let us know in the comments so that everyone can benefit!